Tomorrow, September 28th, the S&P is making some big changes to the sectors of the S&P 500® Index. These changes will have an impact on the overall market and will also impact how Beaumont Capital Management (BCM) strategies will track the overall market. The Telecommunication sector (which was traditionally made up of companies such as AT&T, Verizon, Sprint and some other smaller telephone companies) was less than 2% of the overall S&P 500 index and was not used by many portfolio managers. BCM did not use it as a stand-alone sector in our model, and our exposure to it varied by ETF family. The sector is being revamped to better reflect today’s economy and will be renamed the Communications Services Sector. Along with telecommunications companies, the sector will now also include direct internet companies, entertainment and software companies, and media content companies. This means some pretty big names are moving out of the Technology & Consumer Discretionary sectors and into the new Communications Services sector. Most notably, Google & Facebook are leaving Technology while Netflix is moving over from Consumer Discretionary. We have already added the new Communications Services sector to our model to reflect this update. This move will trim the technology sector from roughly 26% of the overall S&P 500 Index down to around 21%. It will also increase the new Communications Services sector weighting up to around 10% of the index. As a quick summary of what’s happening from a numbers perspective, the Technology sector will lose 7 companies to the new Communications Services sector, Consumer Discretionary will lose 12, and Telecommunications will lose all and cease to exist as a sector within the S&P 500. The new Communications Services sector is expected to be comprised of 26 companies. The reality is that the FAANG stocks of Facebook, Apple, Amazon, Netflix, and Google have made up the majority of the returns of the overall market over the past several years. Three of those 5 stocks are now being moved and will be in the new Communications Services sector. This makes the Communications Services sector a big piece of the market in today’s economy. One of the nuances of BCM’s trend following Sector Rotation model is that we equally own any of the sectors that are currently in an uptrend. This equal weight concept can provide less risk. For example, the Technology sector in 2000 or the Financial sector in 2008 became very large weightings in the S&P 500 and carried the whole market lower when the music finally stopped and those sectors rolled over. An equal weight model can help to keep any one sector from getting too large and increasing the risk of a portfolio. The flip side of this equal weighting concept is that BCM is also potentially underweight a sector that is doing very well. For example, let’s assume BCM owns 10 sectors of the market and has them equally weighted in the portfolio at 10% in each sector. While the risk can be lower than the overall market, if the Technology sector is closer to 26% of the market and being carried by the FAANG stocks, then the portfolio may underperform the overall market. 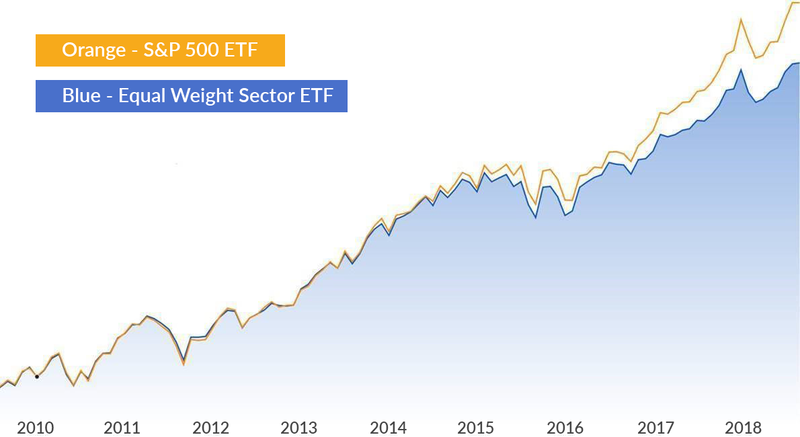 For example, the chart below compares an equal weight sector ETF (blue area) to the S&P 500 ETF (orange line). You can visually see that the equal weight index tracked the S&P 500 Index very closely up until around mid-2014 when the FAANG stocks started to accelerate and carry the market. With the sector changes that are happening this week, now if BCM owns 10 sectors (including both the Technology & Communications Services sectors at 10% each), exposure to these FAANG stocks comes much more in-line with the overall S&P 500. This can help BCM strategies avoid the lag that an equal weight index has experienced in this window with the FAANG stocks outperforming the overall market. Of course, conversely, it could have a higher impact should they underperform while they are held in a given strategy. This all comes together when you layer in BCM’s trend following component that gives us the ability to be invested in a sector while it is in an uptrend, but, most importantly, sell if that sector rolls over into a downtrend. This provides the ultimate goal of growth during market uptrends and some protection when markets eventually rollover into a downtrend. BCM Portfolio Manager and Managing Partner Dave Haviland has spent the last months travelling the country informing clients, advisors, and industry partners on tomorrow's sector reconfiguration. Just this week, he appeared on Asset TV with his outlook among other industry experts. Check out Sector Strategies for a New GICS Landscape below! Copyright © 2018 Beaumont Financial Partners, LLC DBA Beaumont Capital Management (BCM). All rights reserved. Performance data shown represents past performance and is no guarantee of future results. As with all investments, there are associated inherent risks including loss of principal. Sector investments concentrate in a particular industry and the investments’ performance could depend heavily on the performance of that industry and be more volatile than the performance of less concentrated investment options and the market as a whole. Any reference to specific securities or investments is for illustrative purposes only and is not intended as investment advice nor as a recommendation to take any action. Individual securities mentioned may be held in client accounts. The Standard & Poor's (S&P) 500® Index is an unmanaged index that tracks the performance of 500 widely held, large-capitalization U.S. stocks. Indices are not managed and do not incur fees or expenses. An investment cannot be made directly in an index. The BCM investment strategies may not be appropriate for everyone. Due to the periodic rebalancing nature of our strategies, they may not be appropriate for those investors who desire regular withdrawal or frequent deposits. The information presented in this report is based on data obtained from third party sources. Although it is believed to be accurate, no representation or warranty is made as to its accuracy or completeness. The views and opinions expressed throughout this presentation are those of the author as of September 2018. The opinions and outlooks may change over time with changing market conditions or other relevant variables.